Rapid economic and demographic changes can pose serious challenges to governments, especially when a modern welfare system must be built, with a radical shift from family-oriented to state-based social protection. The case of China, as WANG Feng, Ke SHEN, and Yong CAI point out, may be particularly salient in this respect. The fiscal burden associated with population aging has become an increasingly common concern globally. Rising public spending is driven both by unprecedented population aging and by a shift in resource allocation from the family and kin to the state, accompanied by the development of modern state welfare regimes. Among the countries in the world facing the challenges of a rising fiscal burden, China, with its rapidly aging population and its large-scale welfare expansion, is a case in point. China is in the middle of a highly compressed population aging process that is almost unparalleled in the world, due to its rapid mortality and fertility decline. With current fertility of 1.6 children per woman – a level it has now maintained for about two decades – China’s elderly population is expected to account for above a quarter of the country’s total population by 2050, up from a level of 10.8 percent in 2016 (United Nations 2017). China’s population aging also comes with another characteristic: a large share of families have only one child, a legacy of China’s 35-year enforcement of its one-child policy (Wang et al. 2018). Weakened family support makes public support of the elderly especially essential. Benefiting from its economic boom and wealth accumulation over the past few decades, China has taken ambitious steps to revamp and rebuild its social welfare system, especially since the start of the new millennium. Public spending on social welfare in China has grown at a faster rate than the economy as a whole. In the five years between 2009 and 2014 alone, government spending on education as a share of GDP rose from 3.0 to 3.6 percent, on health it jumped from 1.9 to 2.8 percent, and on pensions from 2.5 to 3.6 percent. By comparison, government expenditure on national defense and public security both stabilized at 1.3 percent of GDP over the same period. It is also noteworthy that China’s pension spending has increased at a faster rate than education spending, and by 2014, the former had caught up with the latter, a turning point that most OECD countries had reached by the middle of the twentieth century, but after a much slower demographic transition. The level of welfare provision (still low by international standards but rising rapidly), masks an additional characteristic which China shares with several emerging social welfare systems: inequality. In China, both public health insurance and the pension system remain highly fragmented, and benefit levels vary widely, e.g. by urban-rural residence and employment type (Shen et al. 2018). Within the next 15 to 30 years, China will face unprecedented fiscal pressure to fund its social welfare programs in response to accelerating population aging and inevitable welfare expansion. Using a methodology developed under the National Transfer Accounts (NTA) framework (Miller et al. 2011), we projected the future fiscal burden in China by combining per capita benefit generosity levels derived from an analysis based on the NTA method and UN population projections (Cai et al. 2018). Our projection results reveal that assuming no change in the benefit generosity ratio (BGR) – defined as benefit expenditure per member of the eligible population relative to GDP per working-age adult – and with the medium fertility assumption of the United Nations, public spending on education, health care, and pensions as a share of GDP could increase from 10 percent in 2014 to about 15 percent in 2030, and to over 20 percent by 2050 (Figure 1). An alternative scenario is a gradual increase in China’s benefit generosity level to the 2009 OECD average level by 2030, in line with China’s aspiration to become a high-income society and its government’s promise to deliver adequate public welfare. Under such a scenario, the combined public spending on education, health care, and pensions as a share of GDP could double to 20 percent by 2030 (up from 10 percent in 2014), triple by 2050, and remain above 40% up to 2100 (Figure 1). What do these numbers mean in terms of the fiscal burden for China? According to the IMF estimate, China’s general government revenue (including taxes, social security contributions, property income and other income) rose from 18.3 percent of GDP in 2007, to 24.8 percent in 2010, and to 29.2 percent in 2015. Assuming no further increase in this share (general government revenue on GDP), by 2030 nearly half of all government revenue will be absorbed by these three items under the scenario of “no generosity increase”. Under the scenario of a gradual increase in the benefit generosity ratio, social spending would account for the totality of Chinese government revenue by mid-century. Such a trend is, of course, unsustainable. 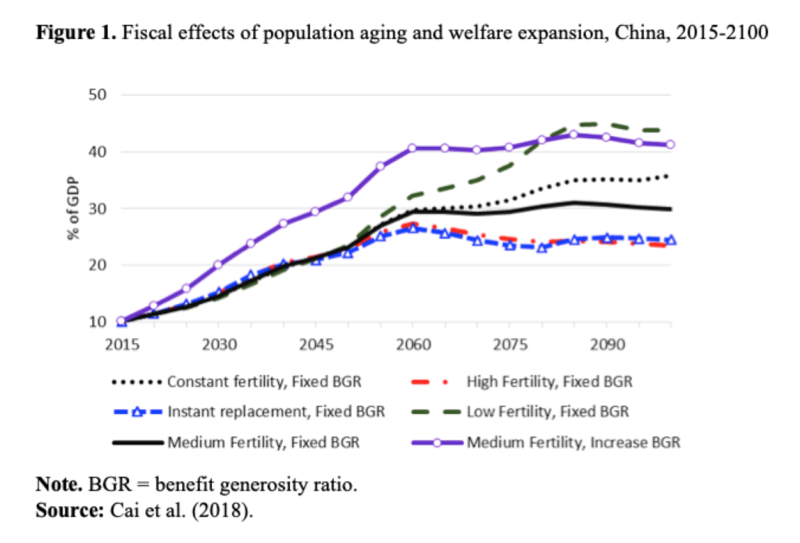 The inevitable increase in fiscal burden associated with population aging and welfare expansion poses hard choices for policy makers in China. To meet rising fiscal demand, the government can either increase revenue or reduce benefit levels. Given the generally low level of benefit generosity in today’s China, particularly for the rural and urban unemployed, it would be politically and socially unacceptable to lower benefit levels. The question is, rather, at what pace can the benefit level be increased? So the available options lie more within the revenue side of the equation. As for pensions, less than 40% of China’s working population are covered by the Urban Employee Pension Insurance, which has a combined contribution rate of 28 percent (20 percent from employers and 8 percent from employees), a rate believed by many to be too burdensome for employers and employees alike. Conversely, government revenue as a share of GDP in China is still relatively low, at only around 30 percent, compared, for instance, with the Nordic countries, France and Belgium, where it stands at 50 percent or more. To top up its pension fund, China has also resorted to another source, selling off shares of its state-owned enterprises. Any substantial future increase in government revenue will come with costs and constraints, however. Raising taxation levels for social spending, which is probably unavoidable, can have negative consequences for investment (other than education) and consumption, which in turn can affect overall economic growth, and it may also increase intergenerational inequality, with adverse consequences for the welfare of the upcoming generations. China’s economic ascendance to an upper middle-income country has come with major social and environmental sacrifices and challenges. One such challenge is to rebuild a social welfare system from the ruins of its socialist past, in a way that proves more homogeneous than it has been thus far, and that is compatible with its market economy system and its rapidly increasing income level. Rapid population aging and continued economic changes will not make things easier. Cai, Yong, Wang Feng, and Ke Shen. 2018. “Fiscal implications of population aging and social sector expenditure in China.” Population and Development Review. 44 (4): 811-831. Miller, Tim, Carl Mason, and Mauricio Holz. 2011. “The fiscal impact of demographic change in ten Latin American countries: Projecting public expenditures in education, health, and pensions,” in D. Cotlear (ed. ), Population Aging: Is Latin America Ready? Washington DC: The World Bank, pp. 233–272. Shen, Ke, Wang Feng, and Yong Cai. 2018. “A benevolent state against an unjust society? Inequalities in public transfers in China,” China Sociological Review, Published online 31 Jan 2018. United Nations, Department of Economic and Social Affairs, Population Division. 2017. World Population Prospects: The 2017 Revision. New York: United Nations. Wang Feng, Yong Cai, Shen Ke, and Stuart Gietel-Basten. 2018. “Is demography just a numerical exercise? Numbers, politics, and the legacies of China’s one-child policy.” Demography 55 (2): 693-719.